Summary: In Tana French's powerful debut thriller, three children leave their small Dublin neighborhood to play in the surrounding woods. Hours later, their mothers' calls go unanswered. When the police arrive, they find only one of the children, gripping a tree trunk in terror, wearing blood-filled sneakers, and unable to recall a single detail of the previous hours. Twenty years later, Detective Rob Ryan - the found boy, who has kept his past a secret - and his partner Cassie Maddox investigate the murder of a twelve-year-old girl in the same woods. Now, with only snippets of long-buried memories to guide him, Ryan has the chance to uncover both the mystery of the case before him, and that of his shadowy past. -Penguin, 2007. I wanted to like this book. Truly, I did. I had always considered getting it, but something in my gut told me I better not - that I probably wouldn't like it. Turns out my gut instinct was right. Don't get me wrong. I completely understand why this novel was hailed as a "masterpiece". The writing is good. The characters are memorable and Ryan makes a good unreliable narrator. Here's the issue I have with it though: the keyword here is "lies". Ryan warns the reader right away that he is a good liar, so the reader knows they can't trust him; all well and good. I'm fine with that. It's mildly annoying to me as I prefer to not be set on my guard right off the bat, but okay fine, I'll go along with it. The reason why I kept coming back to this book was because of the beginning of the summary - the kids who disappear. That kind of plot point intrigues me. I wanted to know the resolution to that. And guess what? NOTHING. HAPPENS. There is no resolution. Is it realistic? Absolutely! There's no absolute guarantee that memories will somehow magically return in full force to a person who has "erased" their memories of a traumatic event like that just because they go back to the scene of the crime. But in fiction? Come on! That's maddening! It's like being told you're going to be fed a five star meal and instead all you get is a slice of bread and a glass of water. I was totally deceived from start to finish and I didn't appreciate it at all. The murder of the girl is an episode of Criminal Minds by comparison. Oh, the psychotic older sister did it? Big whoop - I've seen that before. Those kinds of thrillers are a dime-a-dozen now. Take out the disappearance of the kids and what do you have? A mediocre mystery. 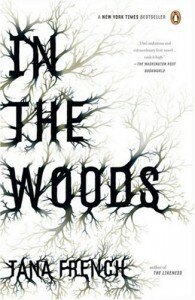 Hell, the best part of the story and where I really got into it was the part when Ryan goes back to the woods at night in an effort to recall the memories and just as he gets to the part where you might find out what happened - he gets scared and runs away. I nearly tossed the book away in anger. That whole scene was just wonderfully written - perfect setup, perfect tension, perfect writing; only for it to be ripped away without any resolution whatsoever. I checked on the next book in the series to see if this was French's "thing" as a writer and it turns out it is - she grabs you in by introducing some mystery link to the main character - only to leave it unresolved and totally leave you hanging. That angers me beyond reason and I don't think it's edgy or cool. I think it's lazy and deceptive. Who cares if it's more realistic? If I wanted realistic, I would've read a true crime book. Ryan as a character reminds me of those types of guys who fall in love with the manic pixie dream girl. Cue the rolling of eyes. The other characters are fine - nothing really spectacular about any of them. Overall, I just found In the Woods to be cruelly deceptive, manipulative, and, once the best part is taken away, extremely mundane and mediocre. I give In the Woods a C.